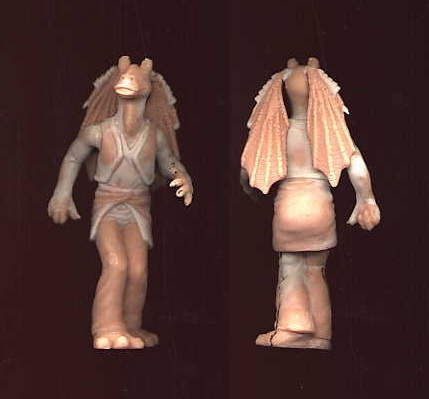 This 3 3/4 inch wax sculpt is for a Jar Jar non-posable figure from Episode I. Although sculpted in the same scale as the Episode I action figure line by Hasbro, the figure appears to be made for some other product. Whether it was used in a production Star Wars product remains a mystery (please contact me if you have additional info). The sculpting itself is made from wax with part lines clearly marked along the edges and tremendous detail in the back and ears.